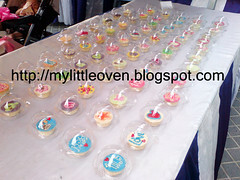 p/s : Order must be placed 1 weeks before pickup date and 3 weeks for bulk order. 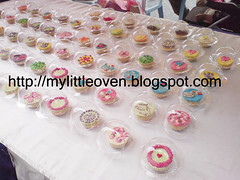 Bulk order will get special prices. 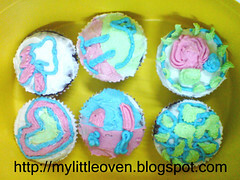 Baked the cupcakes & made the buttercream icing..
My hubby and my sisters (ecah & nieza) are responsible for it..
Just for the sake of try an error..
And the banana flavour is just for fun..
My sisters wanted to know how it tasted..
Order for Kak Haziah baru je siap.. 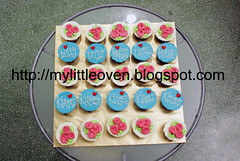 It's for her daughter's 7th birthday on tuesday..
Esok nad nak kena hantar kat office dia..
Enul ordered 50pcs mini cupcake & 8pcs medium cupcake..
Yang 5-pcs tu katnya nak bagi member dia.. 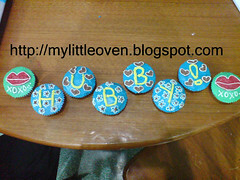 But dia X nak tulis apa² message..
Design plak nak yg comel²..
Yang 8pcs tu dia nak bagi hubby dia.. 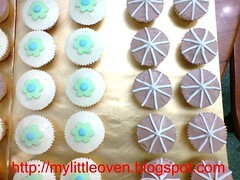 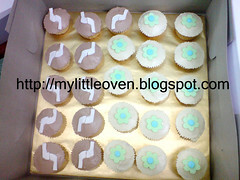 The cupcakes is chocolate flavoured with buttercream icing..
8 chocolate cupcakes with buttercream.. 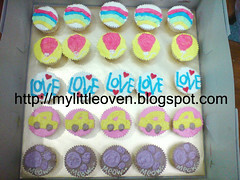 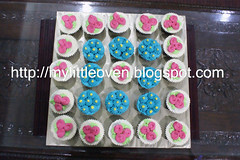 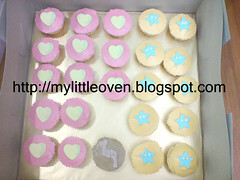 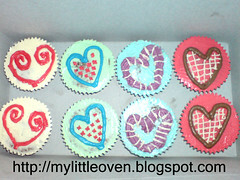 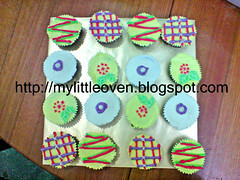 This batch is for my hubby's family..
Just bringing them some buah tangan..
Chocolate cupcakes with buttercream frosting.. 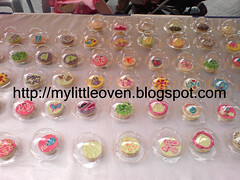 This Vanilla Cupcake with Vanilla Frosting is my favourite..
Tadi enul amik order member dia.. 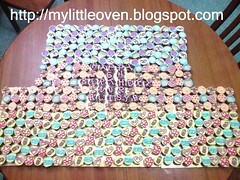 Her friend ordered 400 mini chocolate cupcakes..
For her daughter birthday party..
Untuk berniaga kat cineleisure ni nad bukan buat satu jenis je..
Nad buat bermacam jenis frosting.. 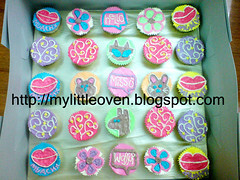 But cupcake dia cuma vanilla cupcakes..
.:: Dream Vanilla & Chocolate Angel ::.
.:: Hawt Mint & Dream Angel ::.
.:: Sweet Strawberry & Tangy Orange ::. 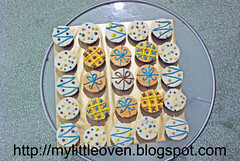 Nad buat frosting vanilla, chocolate, mint, straberry & orange..
Pastu ada gak buat campur vanilla & choclate..
And every one of them ada name sendiri..And fondant design atas frosting..
Yang ada lukisan semuanya buttercream biasa je..
Semuanya dijual pada harga RM2.50/pcs..
Sesiapa nak rasa boleh la dtg sana beli ye..
Insyaallah nad akan ada kat sana every sunday.. 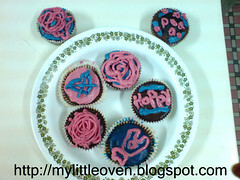 Except for the third sunday mmg Xde..
His birthday is on 18 July..
Nad cuma siapkan cupcake & coklat ganache je..
Birthday boy yang design his own cupcake..
p/s: sorry about the looks..very messy.. 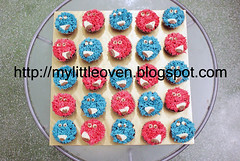 This batch is for selling at cineleisue..
Yup the price has gone up..
Sbb harga barang dekat kedai yg nad selalu amik tu dah naik..
Cant do anything about it.. 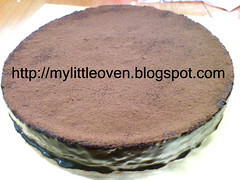 I have to naikkan sikit my price..
Chocolate cheese cake ni nad buat utk birthday mama..
Tahun ni mama ada 2 cake for her birthday..
Satu cake besan dia bagi.. 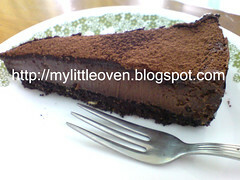 This cheese cake mmg sedap giler..
Base dia nad buat dr oreo cookies..
And i garnish it with chocolate powder..
At the side i smudge it with chocolate ganache..
Kalau nak order pun boleh.. 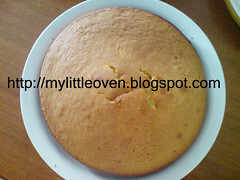 This is butter cheese cake..
Nak try resepi and habiskan cheese yg tinggal..
Just a bit taste of cheese..
Not as rich as chocolate cheese cake kat atas tu..
Petang nad buat malam tu dah habis licin.. 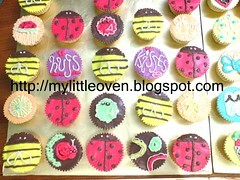 But nad lupa nak amik gambar.. 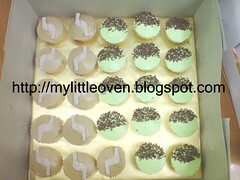 This week cupcakes at cineleisure..
Minggu ni sale not that good..
Ada lagi some at home..
Nak jual habiskan semua ni..
Yang tinggal froting buttercreme, vanilla, coffee, mint,starberry & orange..
Amy order cupcakes ni minggu lepas..
Dia tengok my cupcakes kat cineleisure terus order kat situ gak..
For her hubby's birthday esok..
Esok at noon nad akan jumpe dia dekat A&W PJ..
Sis order 50pcs medium cupcakes..
For her daughter's birtday party (Ara)..
Nisa order 50pcs mini cupcakes..
Nad kena hantar cupcakes ni dekat Royale Bintang Damansara..
Ni buat utk hubby nad punya kekawan..
Yang ni selebihnya nad bagi kawan² nad..
Semalam nad hantar cupcakes dekat kawasan Kota Damansara..
Nisa nak bagi cupcakes tu dekat kawan dia yg sambut birthday..
16pcs of chocolate moist cupcakes with buttercream.. 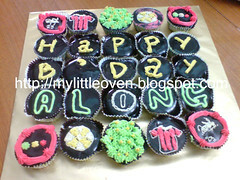 The design pula is Manchaster United Logo & football.. 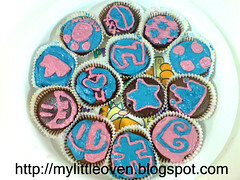 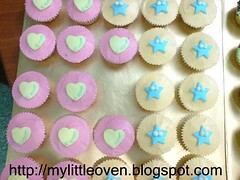 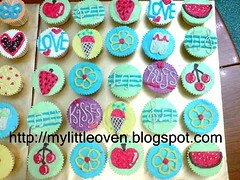 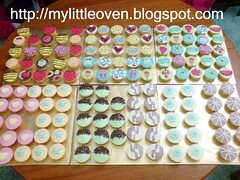 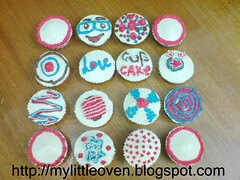 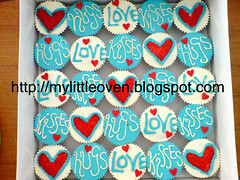 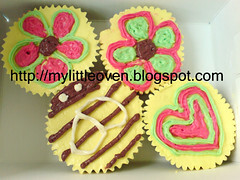 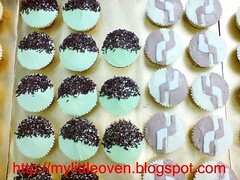 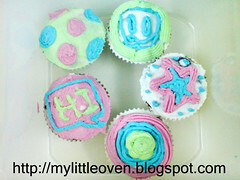 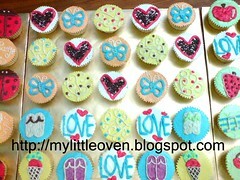 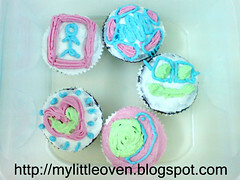 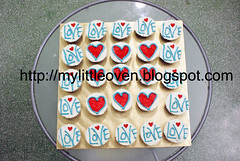 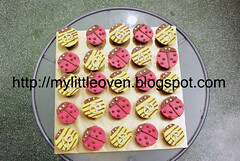 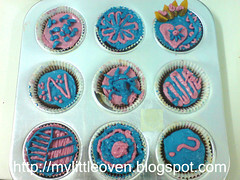 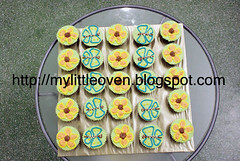 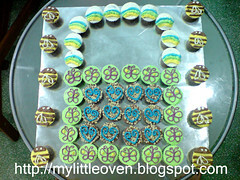 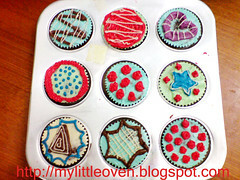 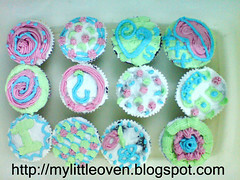 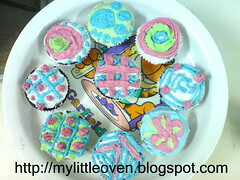 But nad X dpt nak letak gambar cupcakes tu.. 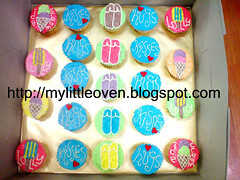 The picture masih dlm HP tu..
Hope lepas HP tu dah betul the pic is still inside..
A student from Uitm (Liana) ordered 150pcs cupcakes..
Chocolate moist cupcakes with buttercream..
She didnt request any specific design..
She said "Akak buat 2, 3 jenis design yang simple je"
But nad saja buat banyak design..
Ada masa and Xde order lain bole la buat..
Kalau bnyk order X dpt la nak buat berdesign-design mcm ni..
Fizi wanted me to bake a cake for his 3rd anniversary..
Nad rasa maybe dia nak buat suprise for his wife..
Berkali-kali dia minta nad buat lawa².. 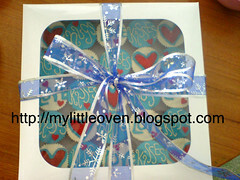 The design plak dia sendiri yg bagi..
Siap buat dlm gambar and email to me utk nad tiru.. 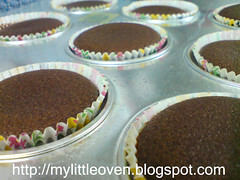 He will pick it up after solat jumaat..
Ieka pula X tau nak amik hari ni or esok..
Kalau dia amik hari ni maybe after margrib nnt..
Or kalau X sempat dia akan amik esok.. 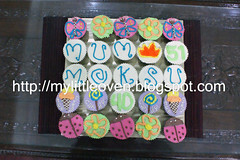 This is for her mum & mok su dia.. 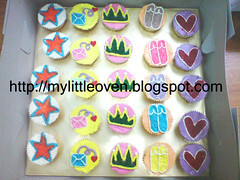 This cuppies plak mama punya..
Mama ada party dekat office..
Mama baru call tny pasal harga..
Maybe ada member dia nak order kot.. 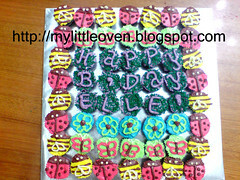 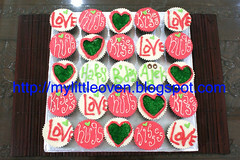 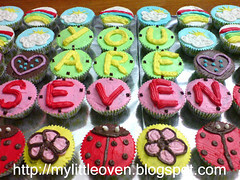 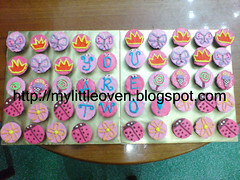 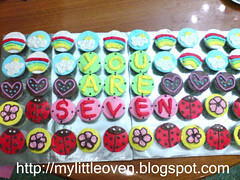 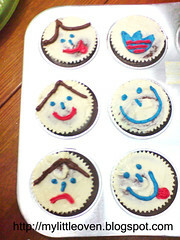 This is her birthday cupcakes..
Just like u like it..